Getting to and from Taiwan Taoyuan International Airport (TPE) is easy, convenient, and relatively inexpensive. Take the Airport MRT to get from Taiwan Taoyuan International Airport (TPE) (A12 or A13) to Taiwan High Speed Rail (THSR) Taoyuan Station (A18). Take the THSR train from Taoyuan to Hsinchu. Transit at THSR Hsinchu Station to Taxi to get to the Ambassador Hotel (Hsinchu) / Landis Inn Chuhu. Please refer to the Airport Website. Click Here. 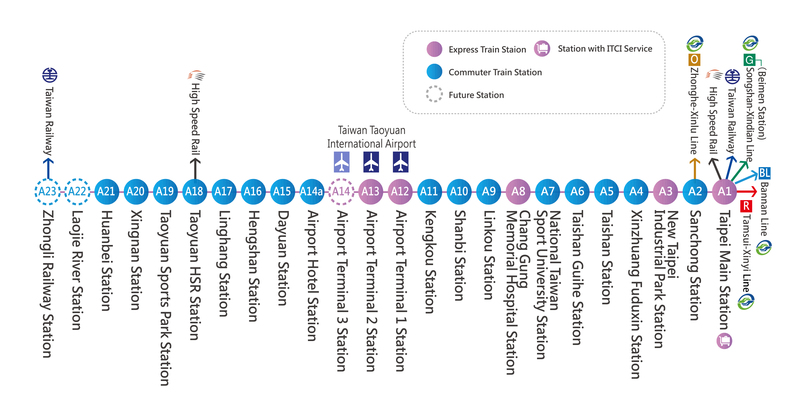 Take the Airport MRT to get from Taiwan Taoyuan International Airport (TPE) (A12 or A13) to Taipei Main Station (A1). Transit at Taipei Main Station to Taxi to get to Miramar Garden Taipei.